Newton’s famous remark, “If I have seen further it is by standing on the shoulders of Giants,” is not in his published work, but comes from a letter to a colleague and competitor. In context, it reads simply as an elaborately polite acknowledgment of previous work on optics, especially the work of the recipient of the letter, Robert Hooke. Newton’s laws of motion provide another set of examples of him standing on the shoulders of giants, as he makes explicit in the Philosophiæ Naturalis Principia Mathematica when describing them. Newton credits one Galilaeus with the first two laws, and writes that the third law was demonstrated first by Johannes Wallisius, and then by Christophorus Wrennus and Christianus Huygenius. At the heart of the laws of motion is an abstraction that Newton called quantitas motus (literally quantity of motion), which actually means mass times speed, paying attention also to the direction of motion. The modern term for this is momentum. Together, the three laws state that bodies can exchange momentum among themselves, but they can’t create or destroy it. If you are standing and then start walking forwards, by giving yourself a forward momentum, you give the Earth an equal backward momentum. Since the Earth is much more massive than you, the backward speed you impart to it is very, very small. This concept of momentum conservation is more or less the starting point of the Principia. To this, Newton adds the gravitational force we now all know. In addition to these concepts and quantities, he then develops new mathematical tools to be able to solve for the paths of moving objects. With these, he successfully describes the orbit of a planet around the Sun (or more precisely, the dual orbits of the Sun and a planet around their centre of gravity). He then attempts to add in the Moon, and suddenly things get much more complicated. Since he cannot solve for the orbits of three (or more) bodies directly, he does the next best thing for a physicist: comes up with useful methods for approximation. Later generations stood upon the shoulders of the Principia in many, many different ways. To give just one example from the 20th century, Emmy Noether created a theorem describing a very general relation between conservation laws (like Newton’s laws of motion) to the symmetries of the world (such as rotational symmetry). But later generations rebelled against one aspect: Newton used lots of figures and prose in his proofs, whereas the mathematical notation we have inherited tries to pack everything into equations. This makes even translations of Principia pretty incomprehensible to a modern reader without expert commentary, even though the material itself may be quite familiar. Perhaps the most important modern commentary is Newton’s Principia for the Common Reader by S. Chandrasekhar, where we can enjoy having a great 20th-century astrophysicist explain what Newton wrote, using modern mathematical language. Sometimes, what appear to be arcane geometrical arguments are actually the steps of Newton inventing differential and integral calculus as he goes along. In one famous section, Newton proves that a massive ball behaves gravitationally as if it were a massive point, and while doing so introduces a mathematical concept otherwise unseen until the 20th century (a Lebesgue integral); it is fascinating (and impressive) to see Newton use physical intuition to develop a construction that was formally developed centuries later for much more abstract mathematics. In the 21st century, we live in a world that Newton could not have imagined. Even time is not absolute in the way everyone had previously assumed—this non-absoluteness is so ubiquitous that it has even snuck into our everyday lives through the workings of GPS devices. Does this mean that Newtonian dynamics is now passé? Not at all! Thanks to space travel and computers, the legacy of Principia is more active than it ever was. Anywhere spacecraft have gone, the relativity of space and time enters at the eighth or ninth decimal place, and if you want to land on a comet or something like that, the Newtonian principles are plenty good enough, just the calculations get complicated. The movie Hidden Figures is set in the early days of space travel, and behind the human drama a scientific drama also unfolds, as the protagonists bring the orbital equations rooted in the Principia to the new science of spacecraft dynamics, (often painstakingly so); eventually, the human “computers” teach themselves to program the newfangled digital ones, but the underlying physical equations remain at the heart of the calculations. Featured image credit: Space, satellite, and window by NASA. Public Domain via Unsplash. Prasenjit Saha is an astrophysicist working mainly on various aspects of gravitational dynamics, including gravitational lenses. Paul A. Taylor teaches programming and signal processing at the African Institute for Mathematical Science, and is also a staff scientist in the Scientific and Statistical Computing Core at the National Institutes of Health in Bethesda, USA. 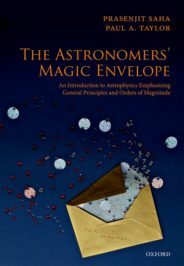 Together, they are the authors of The Astronomers' Magic Envelope: An Introduction to Astrophysics Emphasizing General Principles and Orders of Magnitude (OUP, 2018). Newton himself recognized he didn’t invent any of the laws associated to himself. A French priest, Bullaldius (Boulliau), rolled out the correct universal attraction law (reasoning by strict analogy to light). Galileo found, also according to Newton, the first two laws. Wallis, Wren, Huyghens, found the third, he adds. The logical relationship between the three laws is not clear. The master law is F = ma, the second law. It depends upon an undemonstrable notion, though, the inertial frame. It makes all of Newtonian mechanics what one should call a “local logic”.